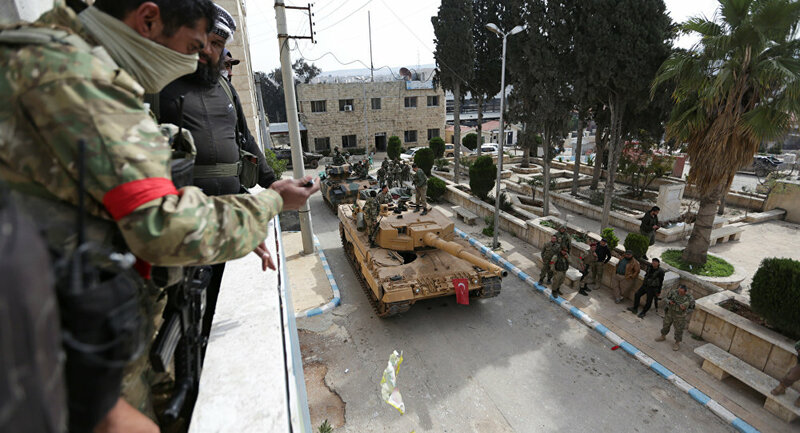 ANKARA (Sputnik) - The Turkish Army and the Free Syrian Army armed opposition group have seized control over the Kurdish-held northern Syrian city of Afrin. "Today at 8:30 a.m. [06:30 GMT] FSA units supported by the Turkish Armed Forces entered Afrin. They established full control over the city. Most of the terrorists fled. Our servicemen and the Syrian opposition are de-mining the booby trap bombs left by them. The [FSA] flag is waiving there," Erdogan said in the Turkish city of Canakkale, as quoted by the NTV broadcaster. He added that Ankara would do its best to fix the infrastructure in the region. — TSK (@TSKGnkur) 18 марта 2018 г. The final offensive on Afrin, which has been under control of the Kurdish militia, was launched early on Sunday morning, the Anadolu agency reported. Erdogan's press secretary Ibrahim Kalin had earlier stated that Turkey was not going to hand in control over Afrin to Damascus. Following Erdogan's statement, the Afrin media center said that Turkey-backed forces had destroyed the statue in the city center, "in violation of Kurdish history and culture." Commenting on the Turkish announcement, the Kurdish administration of Syria's Afrin promised that local forces would become a "constant nightmare." "Our forces are present all over Afrin's geography. These forces will strike the positions of the Turkish enemy and its mercenaries at every opportunity… Our forces all over Afrin will become a constant nightmare for them," Othman Sheikh Issa, co-chair of the Afrin executive council, said in a televised statement. On January 20, Ankara, jointly with the opposition Free Syrian Army forces, launched Operation Olive Branch in Afrin in order to "clear" Turkey's Syrian border from the terrorist threat. Turkey considers the Democratic Union Party (PYD), a Kurdish political party in northern Syria, and the Kurdish People's Protection Units (YPG) militia to be linked to the Kurdistan Workers' Party (PKK), listed as a terrorist organization by Ankara. Ankara's Olive Branch Operation in Afrin has been strongly condemned by Damascus, calling Turkey's move "a violation of the country's sovereignty." In response, Turkish Foreign Minister Mevlut Cavusoglu said that preservation of the territorial integrity of Syria is the common goal of Ankara and Damascus and that Turkish troops are not going to attack government forces in Syria. Moscow has called for the parties to respect Syria's integrity.